Hello! We’re so happy that you all stopped in at our website today! We absolutely love the products that we sell and are sure that you will, too. 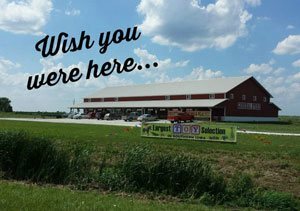 In 2012 my husband, Levi Good, and I purchased our large country store in rural Davis County, Iowa; where there are more cows than people! We love seeing our neighbors stop in to shop, enjoy a free ice cream cone and visit for awhile. Your children or grandchildren will be as thrilled with our toys as our children are. We have three young daughters, Katherine, Kendra, & Autumn, who love trying out our old-fashioned products. And we love meeting the visitors from all over the country who see our signs, stop at our store, and then return when they travel through again. Please sit back, enjoy your visit with us today online (hope to see you soon in person! ), choose some great items, then look forward to getting your free old-fashioned gift shipped directly to you with your order! Thanks again!